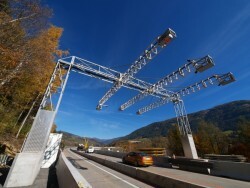 Revenues of the Austrian toll system supplier increased by 90%, EBIT more than doubled in the first half of the fiscal year 2011/12. Kapsch TrafficCom AG today reported results for the first six months of the fiscal year. Revenues amounted to € 278.8m, up by 90.3% from € 146.5m in the same period of the previous fiscal year. EBIT increased from € 18.2m to € 40.1m, bringing the EBIT margin to 14.4%. This article includes a total of 253 words.